When it comes to online casino gambling, MicroGaming can be considered to be one of the pioneers, introducing an online casino as early as 1994. Move forward two decades and MicroGaming are still leading the way, with over 100 online casinos using their casino software. The casino software suite includes such casino classics as roulette, blackjack and video poker, but perhaps the best offering of all being the highly impressive slots – many of these offering huge Jackpot payouts. As well as casino software, the company offer sportsbooks, poker, bingo and network gaming software. In this guide you'll find an overview of the MicroGaming slots that offer the largest jackpot payouts. There are many different ways to land these potentially life-changing windfalls, and these are explained next below. Finally, you'll find my recommendation for the best MicroGaming jackpot slot - and a word about some other big payout games which do not have progressives. MicroGaming jackpots are able to grow so large because they are shared between all of the casinos operating the games. With many millions of players reached, these pooled prizes can be won from any MicroGaming casino. Of course, a slot which has paid out just yesterday might no longer have the biggest headline jackpot amount. The games covered below are the ones which have paid out big wins again and again over time. Some of them have made many players into millionaires already. 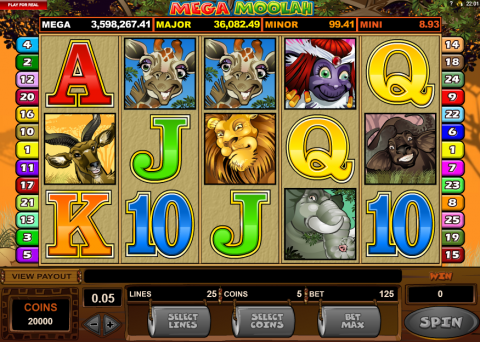 The largest jackpot amount is won when landing the Mega Moolah Mega jackpot, which averages in excess of $3 million. This game has become a bit of an institution, very few slots fans (outside of the US at least) have not yet had at least one session with this famous game. This jackpot is pooled between 3 different slots (Mega Moolah, Mega Moolah Isis and the Dark Knight). This means the same jackpot can be triggered from any of the machines, and also ensures that the amount grows at 3 times the rate of prize pools which are associated with a single game. These games have 4 jackpots, the Mega, Major, Minor and Mini. While any of these are welcomed, the Mega is the one with the truly life-changing payout. The next biggest Jackpot slot is King Cashalot whose payout averages over $800,000. Other slots which have an average payout of over $100,000 are the Major Millions (which features both a 3 reel and a 5 reel slot) and Treasure Nile. You’ll also find two progressive Jackpots over $100,000 on two separate MicroGaming casino poker variations. How are MicroGaming Jackpots won? The way in which a Jackpot can be won will vary from game to game, some being based on the outcome of the actual spins, while others randomly award a chance at the jackpot. The Major Millions slot for example, will award the progressive Jackpot if landing wild symbols across all 5 reels on the 15th pay line (or the wild symbols across the 3rd pay line if playing the 3 reel version). The chance to win the incredibly impressive Mega Moolah Jackpot is awarded randomly – although the higher stakes you’re playing at will give you more chance of this award. Here you’ll be taken to a ‘Wheel of Fortune’ style game with a wheel featuring different coloured segments. The most numerous of these segments are orange and landing on these will net you the ‘Mini progressive’ bonus – with yellow and blue segments winning you the ‘Minor’ and ‘Major’ bonuses. There is one white segment on the wheel, and if it stops here, you’ll win the full Mega Moolah Jackpot – and probably quit your job within days! 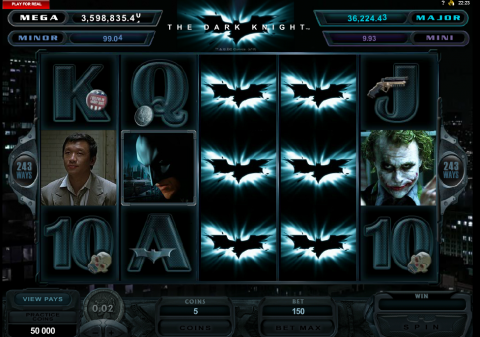 With such an amazing Jackpot amount, it’s hard not to recommend one of the Mega Moolah jackpot range and my personal favorite is ‘The Dark Knight’. This slot has a very stylish feel to it, with a soundtrack that makes the slot highly atmospheric. The game has several features including free spins, wilds and Batman and the Joker will appear randomly and award extra wins. This is a 5 reel slot, with 243 ways to win – meaning that that symbols can appear anywhere on 3 or more reels from left to right to award a guaranteed win. To enjoy the chance of winning these incredible sums I’d recommend heading to the 32 Red Casino. This award winning site enjoys one of the best reputations within the industry, famed for a high level of customer service and the way they look after their loyal players. When joining this site, you’ll be given a no deposit bonus of £10, as well as earning an additional bonus of £32 for every £20 deposit. 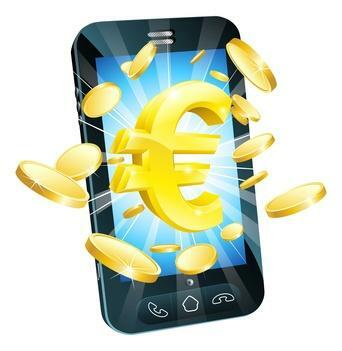 Join today and give yourself the chance to win the Mega Moolah Bonus Cash! See www.32red.com for yourself now!